Laurie Viera Rigler’s debut novel, Confessions of a Jane Austen Addict, was a hit with fans and critics, and a BookSense and Los Angeles Times bestseller. Its open-to-interpretation ending left readers begging for more—and RUDE AWAKENINGS OF A JANE AUSTEN ADDICT delivers. 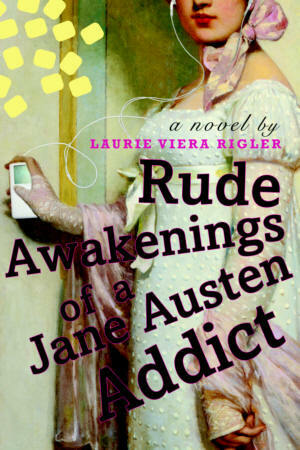 While Confessions took twenty-first-century free spirit Courtney Stone into the social confines of Jane Austen’s era, Rude Awakenings tells the parallel story of Jane Mansfield, a gentleman’s daughter from Regency England who inexplicably awakens in Courtney’s overly wired and morally confused L.A. life. For Jane, the modern world is not wholly disagreeable. Her apartment may be smaller than a dressing closet, but it is fitted up with lights that burn without candles, machines that wash bodies and clothes, and a glossy rectangle in which tiny people perform scenes from her favorite book, Pride and Prejudice. Granted, if she wants to travel she may have to drive a formidable metal carriage, but she may do so without a chaperone. And oh, what places she goes! Public assemblies that pulsate with pounding music. Unbound hair and unrestricted clothing. The freedom to say what she wants when she wants—even to men without a proper introduction. Privacy, independence, even the power to earn her own money. But how is she to fathom her employer’s incomprehensible dictates about “syncing a BlackBerry” and “rolling a call”? How can she navigate a world in which entire publications are devoted to brides but flirting and kissing and even the sexual act itself raise no matrimonial expectations? Even more bewildering are the memories that are not her own. And the friend named Wes, who is as attractive and confusing to Jane as the man who broke her heart back home. It’s enough to make her wonder if she would be better off in her own time, where at least the rules are clear—that is, if returning is even an option.